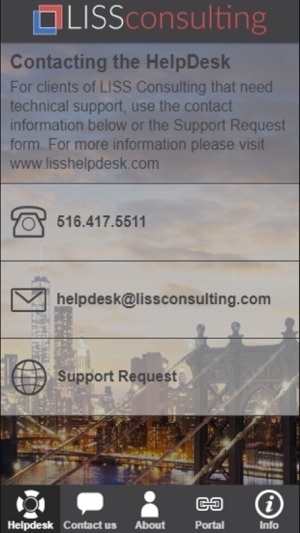 This app is a resource for LISS Consulting clients to easily contact the Helpdesk for support requests, or view other general information. 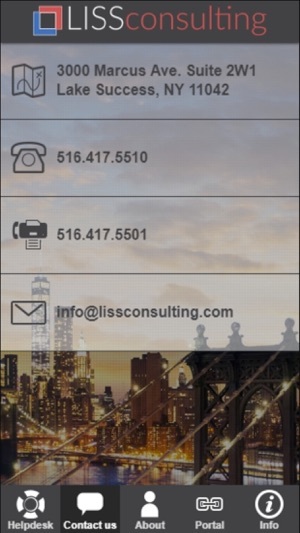 LISS Consulting, created in 1984 to help businesses keep pace with the emerging trends that are now commonplace in the high-technology sector, LISS consulting has always offered the very latest in business-efficiency models. Our focus: to use today’s leading techniques and technologies to amplify business productivity and, ultimately, selling power. 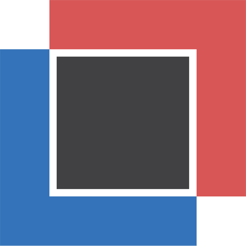 Founded by Steven Reisman on the principle that technology efficiency is the life support of any successful business practice, LISS has been serving the legal, real estate, accounting, small business, and countless other industries for three decades with unparalleled service and support.